The Puranas give many and varied accounts of Hanuman's birth, but they all agree that he was endowed with extraordinary valour, erudition, and devotion to Rama. "In the epics of no other country, "writes Vettam Mani, the author of Puranic Encyclopedia, "could be found a character that belongs to the animal kingdom who is as powerful, erudite and philosophic as Hanuman." When he was still a child, his mother, Anjani, had assured him that he would never be destroyed and that fruits as red and ripe as the rising sun would form his food. Thinking that the glowing sun was a ripe red fruit fit enough for food, the monkey child made a jump at it. According to a popular legend, he saw Airavata and tried to gorge himself on it. 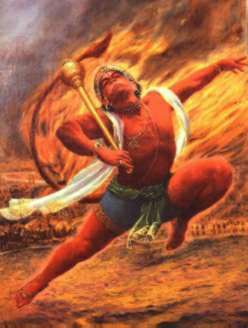 Seeing this attempt of the valorous monkey, Indra used his thunderbolt (vajrayudha) which hit the child's chin (hanu) and hurled him to the earth. 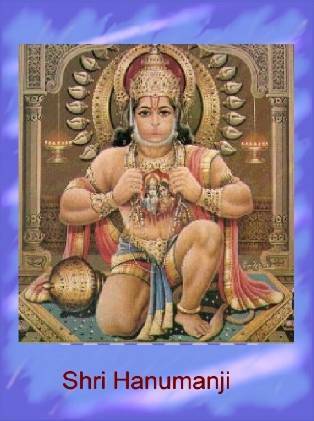 (It is from this event that Amjani's monkey son came to be known as Hanuman.) When Vayu, the Wind god, carried him off to Pataal in such a precarious condition, life on earth came to a standstill in the absence of air. Living beings felt breathless and were driven to the verge of death. Accompanied by the gods, I3rahmawent to the nether regions comforted Vayu and congratulated the monkey child, blessing him with immortality, invulnerability, enduring devotion to God, and prowess. Indra said, "No weapon of any kind shall wound you or hit your body." Agni blessed him, Saying, "Fire will never burn you." Kaal was no less generous, "May not death overcome you." All the gods cried in one voice, "None will ever equal you in strength and speed." Vayu blessed him with more speed than he himself had. 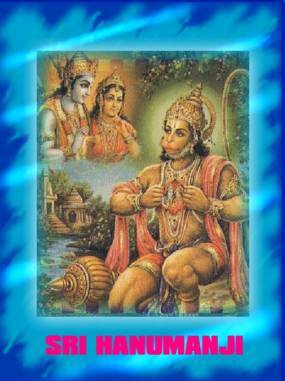 (For many more details concerning Hanuman's life and exploits. 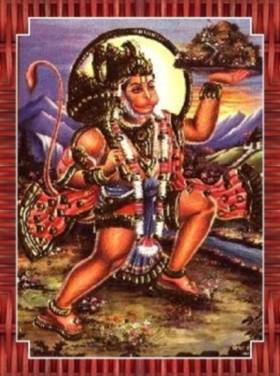 One of Hanuman's popular epithets is Pavansuta, which means that he was the son of Vayu (Pavan or Maruti, the Wind, and Anjani) . 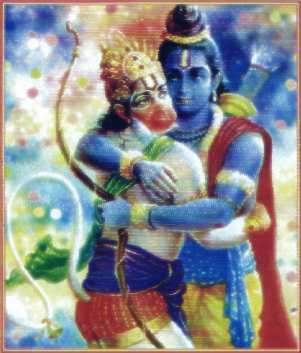 He first came to know Rama when he was searching for Sita. It was he who located Sita in Lanka, and when Laksman was wounded, it was he who brought the life-giving herb to revive him. According to a well-known tradition, his mother Anjani was Brihaspati's maidservant and was called Punjikasthala. One day when she misbehaved with her master by covering him with kisses, Brihaspati cursed her, causing her to be metamorphosed into a female monkey called Anjani. She then lived with a handsome monkey called Kesari as her husband. Another tradition holds that Hanuman's father was Shiva who, finding Parvati reluctant to give birth to a monkey, entrusted the child in embryo (in Parvati's womb) to Vayu, who carried it with him from place to place till it became mature. Then, finally, he deposited the monkey embryo in Anjani, the monkey woman. Hanuman (also called Hanumat because he had `large jaws') is re-garded as a monkey-chief, one of the most celebrated of a host of semi- divine monkey-like beings, who according to the Ramayana (i.16) were created to become the allies of Rama in his war with Ravana. Hanuman is fabled to have assumed any form at will, wielded rocks, removed moun-tains, mounted the air, seized the clouds, and rivalled GaruRa in swiftness of flight. In modern times Hanuman is a very common village god in southern, central and northern India.